This is Gabe and his favourite nook. For some strange reason, he always like to squeeze himself in between the cabinet and the aquarium. Like his old man, also like to relak one corner one! LOL! Chocolate Gal: Not serious lah. Probably just captivated by the fishes. Akk: What a mind-popping statement. I was reading it until my eyes popped! aloe: That is the kids' play-mat that we roll up and keep when not in used. I think he likes that corner for the feeling of cosy security. strange ! 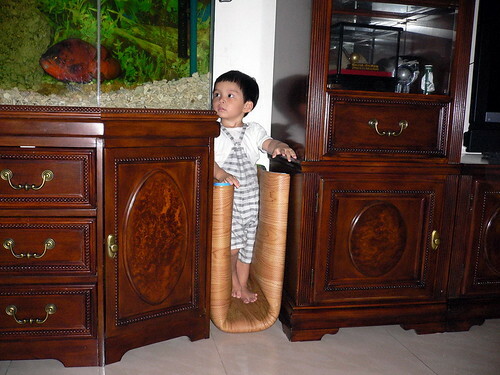 why would u like to have a gap btw the cabinet n aquarium ? why ? Yanzzz: So that I won't have a gap between the other side of the aquarium and the wall.